Use TB2VTYA to reference this item. *The Prize Is Safer Roads For All. * We've All Been Touched By The Loss Of Someone To Avoidable Accidents On The Roads. Like The Cachin' Crow, We Drop Coins With Safety Messages To Remind Folks To Drive As If Your Life Depended On It !!! 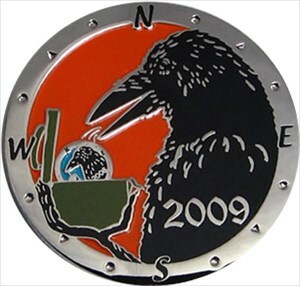 ***PLEASE MOVE THIS COIN ALONG AND KEEP THE MESSAGE OF SAFER ROADS MOVING ON ***** We Thank You !!!!!!!! We Are ....Todie Joe & Roddy & KAboom & WriteShopRobert & Opalsns & Team CeDo & MaineFamily & LadyB4T & Gatoulis & Sivota & SunsetMedowLark & Sparticus06 & Surteb & JohnMac56 & Geo.Error & UFGatorGirl & DaFunkyFrogs & Usyoopers & DJ.J.Rock. ** Come Join Us At Todie's Wild Ride Thread and Help Spread The Message For Safer Roadways** ........WE PLAY TO WIN !!! Did not find in visit to tobey today. Moving it on to another cache. Please tell us your story, It may help save a life.